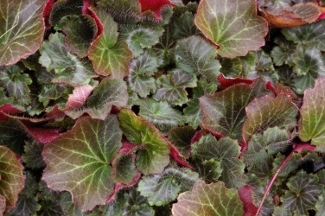 Joy Creek Photo Archive (c) all rights reserved Even though the burgundy-colored leaves of Saxifraga stolonifera 'Maroon Beauty' are smaller in size than those of many selections of Saxifraga stolonifera, they are still dramatic. Imagine the pewter-veined surface of the leaves sparkling with a scattering of fine silver hairs. Here and there, the flash of the red underside of a leaf will call attention to itself. During the summer, the 15-inch flowering stems bear up to 100 flowers drawing the eye away from the beauty of the foliage. We have found that the strawberry saxifrages need consistent moisture. They seem to do best in well-draining soil and not in heavy clay. In habit, they increase by runners, just like strawberries. Given a little time, they will form an easy-to-manage mound. Summer. 12 in. x 12 in.